Lockable drawer(s) (keyed alike) with 2 keys - drawer size: 5"h x 16"w x 20"d (standard on models JT, JP and JX). Lockable handle on 12 gauge door with 2 keys (Models JM and JX). Durable 12 gauge steel shelves, 14 gauge sides, and 12 gauge caster mounts for long lasting use. 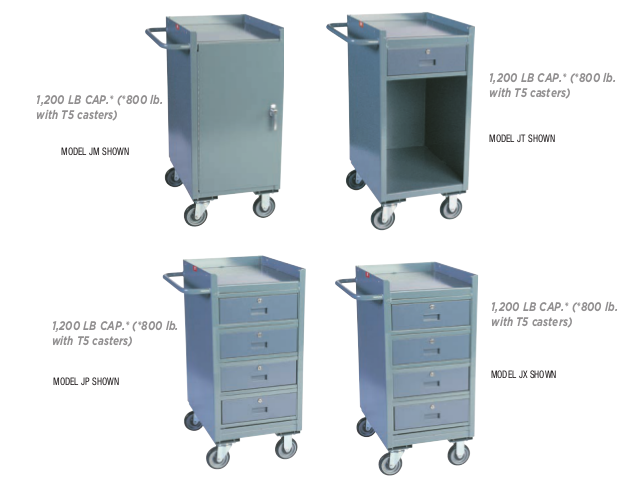 Larger casters (page 201) available.